A bridal shower is an incredibly special day in a woman’s life. When she’s busy organizing the wedding, her family and friends are planning a day full of pampering and love. One thing everyone’s wondering – what’s the theme of the occasion? Drew Snider’s friends and family planned a stunning bridal shower full of rustic charm and chose to hold it at The Bottle House. We couldn’t be happier! 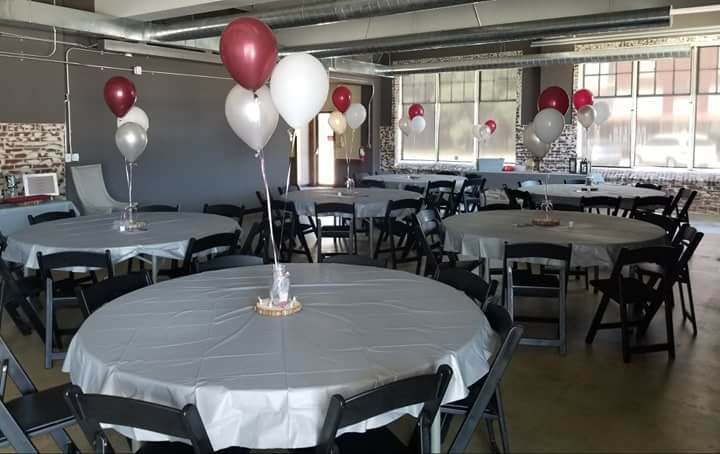 Our venue, with its brick walls, wood details and large windows, was basically made for a rustic bridal shower! 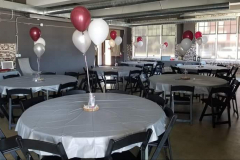 The group decorated the venue in an elegant palate of greys and maroons. Wooden lanterns and candles dotted around the room really brought the space to life! On each table, guests found wood centerpieces with candle-filled mason jars, which added a dash of Southern charm. 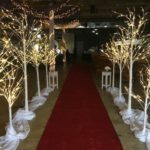 Each centerpiece featured a photograph of the beautiful couple, making the centerpieces that much more special. There were three guests in walkers and one guest in a wheelchair who attended, and our zero entrance was perfect for them to fully enjoy the day’s festivities. As the venue filled up, guests were greeted to a custom monogram on our 150″ projector screen showing a photo of the happy couple. 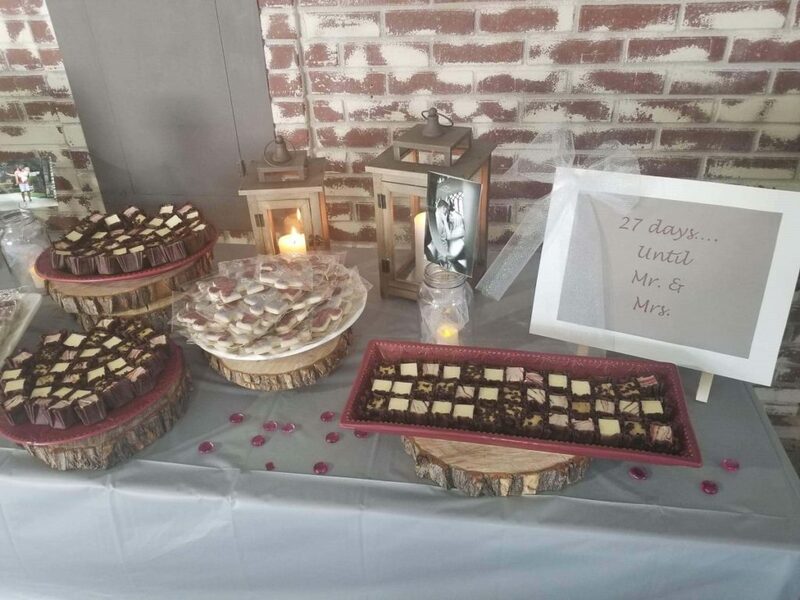 The banquet table proved to be especially popular as everyone helped themselves to servings of custom cookies, Maggie’s popcorn, Hershey’s kisses and fudge. 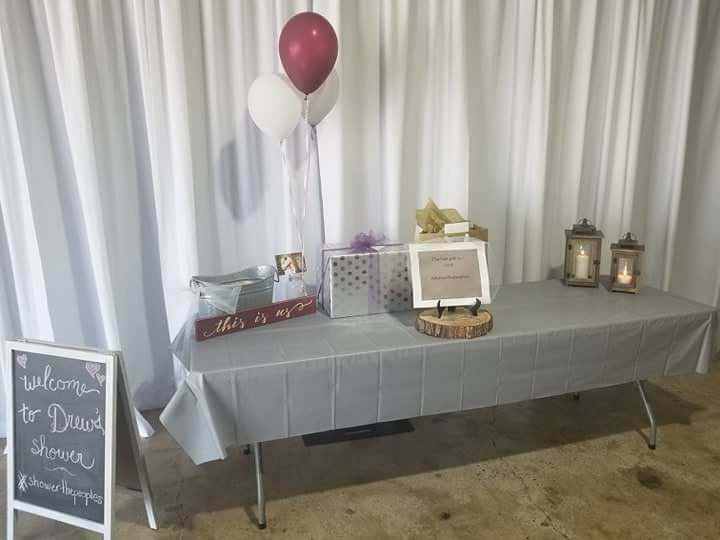 To top it off, signs with sayings such as “All you need is Love…and desserts” accented the table, adding to the evening’s fun and light-hearted mood. 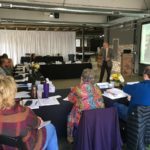 As the day winded down and everyone’s bellies were full, delicious refreshments were up next! Champagne glasses filled with ginger-ale, pomegranate juice and fresh fruits were being passed around the room. The Bottle House team had a blast throwing together this elegant, rustic bridal shower for Drew. With their wedding date approaching on August 18th, we wish the beautiful couple an amazing start to their life together as newlyweds! 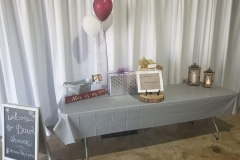 Contact The Bottle House today to start planning your perfect bridal shower.